The reviews are in, and the TrailMaster Mid XRX go-kart is a customer favorite. With go-kart riding as great family adventure, you want to make sure your kids start out with the right kart. This is why the TrailMaster Mid XRX was created. This go kart is a perfect combination of fun, agility, reliability and easy operation. The TrailMaster Mid XRX go kart is the best built mid-size youth go kart on the market. This offroad go-kart was designed for a 6 year old to a 12 year old rider but can accomodate a small to average size adult. The seating area is roomy enough for an adult plus an average sized 8 year old. The TrailMaster Mid XRX has an adjustable driver's seat so that two different sized riders can ride without being uncomfortable. The Mid XRX has high side rails, tall top bars for plenty of head room and new 5-point seat belts for a safe and comfortable ride. 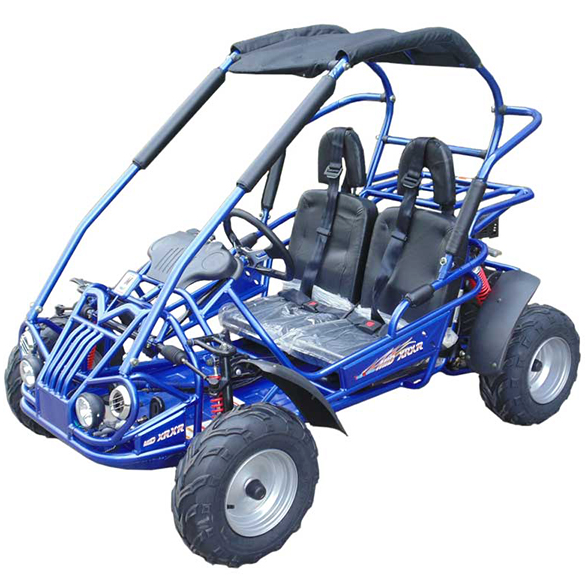 This go kart has large tires and fenders and can accomodate open grass fields, gravel driveways, pastures and intermediate trails. Cooling: Air Cooled Drive: Rear Wheel Drive L x W x H 67" x 43.3" x 51.2"
Battery: 12V Rear Tire: 16 x 7 - 8 Pedal to Seat Back: 34" to 39"
Check out the next model in our go-kart lineup. Quality product. My four year old loves it and so do I. Very fast shipping. I definitely recommend this product. The Mid XRX go-kart is great, but the assembly instructions that came with it from TrailMaster leave a lot to be desired. However, GoKartMasters.com sent a more detailed assembly guide with pictures making assembly a breeze. The kids love their new go-kart!